Several seldom-heard delights were among the pieces performed Saturday night by the Smithsonian Jazz Masterworks Ensemble during a tribute to the late jazz legend Benny Carter. Some of the tunes, unearthed by saxophonist and ensemble director Charlie Young after examining Carter's scores in the Smithsonian archives, were so obscure they lacked titles. Instead, numbers had been assigned to them. Surely a ballad as dreamy as "51," with its swirling harmonies, deserves a better fate. Young's research paid off handsomely in the concert at the National Museum of American History's Carmichael Auditorium. 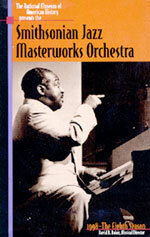 Besides being well suited for a sextet performance, the music colorfully displayed Carter's prodigious gifts. Mostly mid-career compositions -- Carter died in 2003, at age 95 -- the pieces included the signature tune "When Lights Are Low" (complete with the original and little-known bridge) and "Malibu," a noirish theme that brought to mind Carter's extensive film work. Mood shifts were built into the program, triggered by tailored-for-Basie swing ("Easy Money"), a Carnavalesque romp ("Southside Samba"), a rollicking, piano-driven blues ("Boogie") and several lyrical ballads. A Duke Ellington Orchestra alum and Howard University professor, Young projected a full, rounded, gliding tone on alto that evoked Carter's harmonic finesse. At one point, he used a soprano sax, which Carter rarely played, to illuminate the sinuous melodic charm that distinguished the ballad "Ennui." Other performances boasted crisp ensemble work and were enhanced by the solo space allotted to trumpet and flugelhorn player Tom Williams, trombonist Bill Holmes, pianist Bob Butta, bassist James King and drummer Harold Summey. Quincy Jones may be best known these days as a pop record producer, but his own recordings, big band charts and film scores are held in high esteem by musicians and aficionados. The Smithsonian Jazz Masterworks Orchestra devoted a weekend in July to celebrating the compositions and arrangements of Jones, and they brought his music to life with vitality and skill. The SJMO, under the direction of David N. Baker, is one of the most accomplished repertory bands in jazz, so it's no surprise that they've built a loyal and growing audience in the nation's capital. The capacity and quite vocal crowd was rewarded with lots of hard swing and some memorable solos....As usual, trumpeter Tom Williams and tenor saxophonist Loren Schoenberg contributed some creative, quote-filled variations throughout, but the most impressive solo spots belonged to saxophonist Charlie Young, whose huge sound filled the theater without any amplification, and trumpeter Joe Wilder, whose beautifully sculpted solos exemplified the ultimate in taste and sophistication...Quincy Jones conducted several of his pieces during the concert's second half and the band responded with passion and vigor. Jones is one of the great conductors in jazz; he not only sets the tempos and cues the various sections, his motions, gestures and expressions are those of a very hip, improvising dancer. Like any good dancer he uses his entire body to bring out the joy behind the notes. When the Smithsonian Jazz Masterworks Orchestra celebrated the big band music and genius of Quincy Jones at the Lincoln Theater Saturday night it went straight to the source-himself. For the first half of the program America's music man sat in the audience, clearly marveling at the ease with which the ensemble embraced his wide-ranging jazz repertoire with only two days of rehearsal. During the second half Jones briefly stood in for conductor David N. Baker and led the orchestra through a colorful and challenging maze of jazz charts based on standards and original pieces. By the time he finished escorting singer Delores King Williams offstage, after a delightful Ella Fitzgerald inspired reprise of "I'm beginning to see the Light," you couldn't wipe the smile off the maestro¹s face with a trowel. Sharing his joy wasn't difficult, since the orchestra consistently delivered the goods....The common denominator was finesse, a virtue demonstrated by the ensemble and its many gifted soloists, including saxophonists Shannon LeClaire, Loren Schoenberg and Charlie Young plus trumpeters Tom Wiliams and Joe Wiider. At the Lincoln Theater Saturday night, the Smithsonian Jazz Masterworks orchestra celebrated Louis Armstrong’s genius in settings large and small, spirited and sublime....Under the direction of David N. Baker the ensemble adjusted its size throughout the evening to deftly illustrate various aspects of Armstrong’s extraordinary innovations and impact. At one end of the spectrum were full-bore big-band arrangements by Fletcher Henderson and others that demonstrated how the trumpeter's tone and attack helped shape the sound of the swing era. These performances were enhanced by guest trumpeter Randy Sandke and fellow brass man (and Armstrong colleague) Joe Wilder, who managed to evoked Armstrong's vitality and expressiveness without a hint of mimicry....The presence of singers Miles Griffith and Delores King Williams also ensured that Armstrong's profound influence on generations of jazz and pop vocalists wouldn't be overlooked. Although they consistently delighted the packed house, Griffith and Williams were never more charming or spontaneous than when recalling the special chemistry that sparked Armstrong's memorable collaborations with Ella Fitzgerald.